Mission First Housing Group is proud to dedicate 48 units of affordable, senior housing at 1 Spring Street in the center of Bordentown, New Jersey. The project features the adaptive reuse and rehabilitation of the former Eagle Shirt Company factory (also Union Pants Mfg. Co.) into 21 one-bedroom apartments, and the new construction of a three story building addition of 27 one-bedroom apartments. Five of the 48 units will provide supportive housing for veterans. All units contain a full service kitchen, ample closet space, and open living area and a full bathroom. 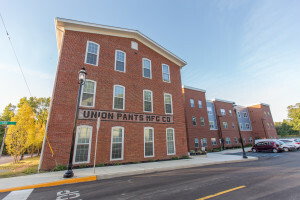 Union Eagle Senior Apartments has community space for residents’ use as well as service and programming delivery, a laundry room and leasing and management offices. A comprehensive social services program, designed to meet the needs of residents, complements the housing. The project is located within a redevelopment area of the city and will be a vital component of the neighborhood’s revitalization. The sustainable design features of this project satisfy the standards of New Jersey’s ENERGY Efficient Homes and USGBC LEED© for Homes programs. This design employs continuous insulation through its entire envelope without any thermal bridging, high performance windows and doors and state of the art appliances and equipment that are high performing and energy efficient. The project was developed using low VOC materials for improved indoor air quality, and a balanced heat and moisture recovery ventilation for maximum cost savings to future residents. The funding for Union Eagle Senior Apartments comes from New Jersey Housing Mortgage Finance Agency, Wells Fargo Bank, Burlington County and Affordable Housing Program funds from the Federal Home Loan Banks of Pittsburgh and Atlanta. Interested in living at Union Eagle Senior Apartments? Click here for more information.